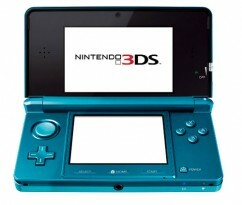 Home » Games » Nintendo 3DS Review – The Good, The Bad And The 3DS! The long awaited Nintendo 3DS is finally here and it would be a shame not to say something. I’ve held every Nintendo console in my hands and rushed to the store to procure the latest member of my little family. Upon gently removing the new babe from its container I was quite pleased, the blue (I obtained the Aqua version) varies on different parts of the console and sparkles in the light just enough to distract me in a wonderful way. The system is slightly heavier than the Nintendo DSi and can actually fit into the same carrying case in most situations. The new stylus slides to different lengths and is much sturdier than its predecessor. The power button is in the bottom right corner and there are now flat “home,” “start,” and “select” buttons at the base of the screen. Turning the system on for the first time introduces players to a simple tutorial that gets a little bit of information from players and reveals how the 3D without glasses component works. This was originally a concern for me because I wear glasses and was unsure if they would cause a problem with the 3D aspects of the system. I was pleasantly surprised to find that the slide that allows players to change the intensity of the 3D (from Max to Off) also alleviated my concern by allowing me to adjust my system until I felt comfortable. The system comes with many improved versions of the included software from the DSi. The camera and sound functions now sport a 3D look as well as 3D functionality. The games that come on the 3DS also proved to be extremely fun. The Miis Maker provides a bit more detail, and if making Miis isn’t your thing, then you can take a picture of yourself and the Mii Maker will create one for you. 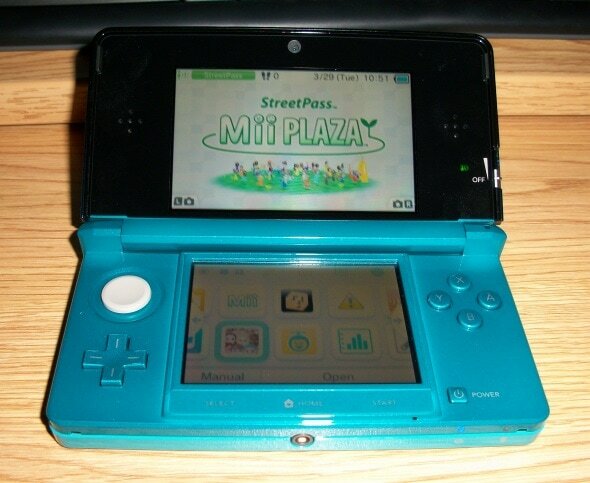 The Street Pass function allows players to interact with other 3DS owners as they go about their day. Encountering other system owners allows players to play mini games and collect puzzle pieces. You can also add the Miis you encounter to your own collection. Face Raiders allows players to shoot flying circular images of people that they have taken pictures of. This game isn’t one that I would normally play, but after taking a few moments to see what it actually was, I found it to be much more fun than I normally find first-person shooters to be. The final game type (and my personal favourite) is the Augmented Reality gaming, this was also what Zath thought was the best part of this new handheld when we tested the Nintendo 3DS at a preview event, so be sure to take a look at that article too. This game has players place a yellow card with a box resembling the ones from many Mario games on a flat surface and stare at it. After registering the card, a yellow cube with eyes appears on-screen for players to shoot. The box disappears and gives players their first game: Archery. After completing this game, several other games appear for you to play. Three games involve the other cards (all sporting different Nintendo Characters) that the AR pack comes with and lets players take pictures, draw, and amuse themselves with. The other two games are fishing and an odd cross between pool and putt putt golf. The archery, pool, and fishing games all end in boss fights against a 3D dragon and can have new levels unlocked with coins gained by walking around with your 3DS. Several components need a system update in order to be used (internet, DSi and 3DS ware, and transferring games are the main ones). I originally thought that the system update that gives gamers an OK GO music video also included the system update needed for the aspects of the system. I was wrong. The system update will not be available until May! That is the equivalent of telling me that I have an ice cream cone somewhere, but I can’t get it until next month. I’m assuming that Nintendo is making players wait so they will be more likely to purchase the games already available, but I can’t help but think that this is quite sloppy and infuriating to those who purchased the system on the release date. Overall, the Nintendo 3DS is more than what I expected, even if Nintendo is hiding my ice cream cone. Jessica Hart is a gamer with a degree in English. In her free time she likes to play video games and mess with shiny things that she finds in electronics stores. When she sees something interesting, she writes about it and sends in to Zath! Nintendo 3DS Battery Only Allows 3-8 Hours Gaming Per Charge? – Don’t Leave Home Without Your Charger!